I've made a few updates to the fragment-based screening approach to drug discovery pages. Added a little on strategies for following the initial leads and also updated the details on drugs in the clinic discovered using fragment-based approaches. Hit rates for Fragment-based screening appear to be higher, typically 3-10%. Whilst there are a number of biophysical methods used for Fragment-based screening structural information is often a critical step in moving the programme forward. X-ray crystallography is a very powerful technology for use in converting a "hit" into a lead for drug discovery. However, the experimental overheads have historically been too high for it to be widely used for primary screening. The X-Chem project at Diamond aims to make the technology more widely accessible. At Diamond beamline I04-1, the full X-ray screening experiment has now been implemented as a highly streamlined process, allowing up to 1000 compounds to be screened individually in less than a week (including 36 hours' unattended beamtime). The process covers soaking, harvesting, automatic data collection, and data analysis; fragment libraries are available, though users can bring their own. An overview of the process is available here in practice, users must generate the crystals in their home lab, and are required to come and perform soaking and harvesting themselves. Users do not need to be present for the X-ray data collection when data is collected automatically. 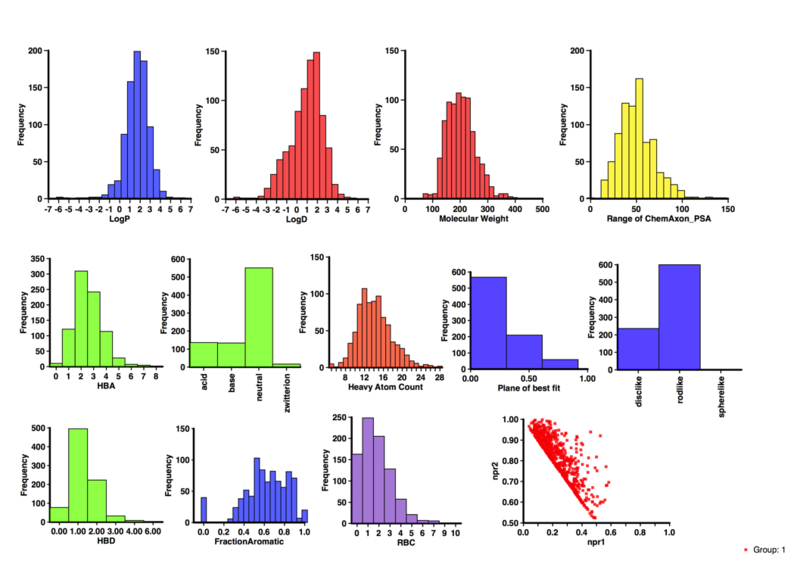 Data analysis builds on the existing automatic data processing, and they have developed tools to streamline density interpretation and refinement (PanDDA and XChemExplorer). Use of these tools at Diamond is optional but highly recommended. Whilst users are free to bring their own libraries a number of libraries are also available these include the Maybridge 1000, Edelris fragments, and Diamond-SGC Poised Library (DSPL), a fragment library designed to allow rapid, cheap follow-up synthesis to provide quick SAR data. The calculated physicochemical properties of the DSPL fragment collection are shown below. For more details on the design of the library O. B. Cox, K. Krojer, P. Collins, O. Monteiro, R. Talon, A. Bradley, O. Fedorov, J. Amin, B. D. Marsden, J. Spencer, F. von Delft, P. E. Brennan, A poised fragment library enables rapid synthetic expansion yielding the first reported inhibitors of PHIP(2), an atypical bromodomain. Chem. Sci.,2016. 7: p. 2322-2330 DOI. I've just updated the published fragments page. I’ve just updated some of the fragment based screening pages, in particular I’ve updated the section on Published fragment Hits. 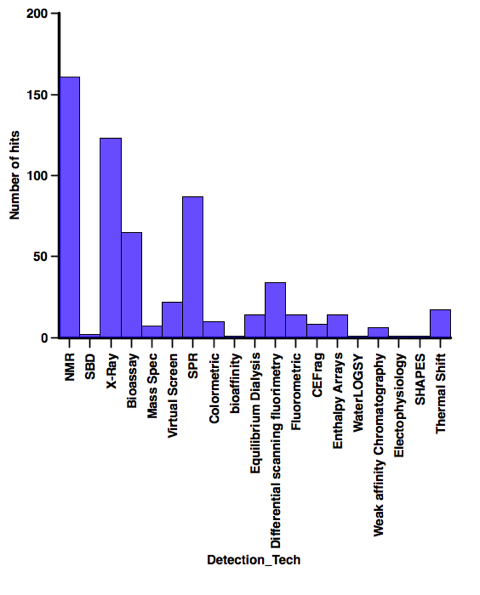 The database now contains 1216 entries culled from over 240 publications directed at nearly 174 different molecular targets using 26 different detection technologies. I also noticed that a fragment library I was helped design is now commercially available, The Selcia Fragment Library was designed to have broad applicability and chemical tractability. It is also one of the few libraries where solubility has been confirmed experimentally. The profile of the library is included in the fragment library profiles. I'm in the process of updating the fragment-based screening section of the Drug Discovery Resources and I came across this news article from the Diamond Light Source is the UK’s synchrotron. At Diamond beamline I04-1, the full X-ray screening experiment has now been implemented as a highly streamlined process, allowing up to 500 crystals to be soaked and harvested in a day, and collected in 24 hours beamtime. The process covers soaking, harvesting, automatic data collection, and data analysis; and fragment libraries are available, or users can bring their own. This is available to both academic and commercial users but the application process is different. If you are interested there is a very useful checklist that should simplify the process. The facility is based at beamline I04-1 and nearby Lab 36, where the soaking and harvesting is performed. In practice, the experiment will span a few days and even multiple visits to establish crystals' suitability. Users must generate the crystals in their home lab, and are required to come and perform soaking and harvesting themselves: multi-day Lab Visits will be scheduled separate from normal beamline time. In contrast, users do not need to be present for the X-ray data collection, although they are asked to help monitor (remotely) the automated collection when it occurs. A local contact will be assigned, same as for beamtime. In practice, the first steps to unsure reproducibility are iterative and require a few dozen crystals, and in difficult cases even several Lab Visits; but associated diffraction testing will be fitted in during the Lab Visit where possible. The final "Full run" soaking and harvesting will be scheduled once the soaking protocol is confirmed (in favourable cases during the same Lab Visit). Data analysis builds on the existing automatic data processing, and we are developing tools to streamline density interpretation and refinement, analysis and presentation of hit results, and depositing hit structures. Use of these tools is optional, but feedback valued: they will be deployed on Diamond's compute environment as they become available. The Diamond fragment collection is actively evolving from the original Maybridge fragment collection, on the one hand to eliminate compounds that are poorly soluble, unstable or systematically kill crystals. On the other hand it is being expanded with synthesis-ready compounds. A paper entitled Promiscuous 2-Aminothiazoles (PrATs): A Frequent Hitting Scaffold appeared in J Med Chem recently DOI, in which they describe the promiscuous nature of 2-aminothiazoles in screens. I thought I'd check how often this substructure appears in the published fragments database, indeed currently 43 of the 903 published fragments contain this substructure. Further investigation identifies a total of 63 amino-substituted 5-membered heterocycles, and there are 167 fragments in which there is an amino group on an aromatic ring (mainly heterocycles). It should also be noted however that there are 64 structures in the DrugBank database that also contain a 2-aminothiazole, so whilst promiscuous they can be developed into drugs. So whether they are privileged structures or troublesome promiscuous hits is probably in the eye of the beholder, caveat emptor. the molecular weight cutoff was set, arbitrarily, at aspirin's 180. I excluded the inhaled anaesthetics, only allowing things that are oils or solids in their form of use. As a small-molecule organic chemist, I only allowed organic compounds - lithium and so on are for another category. An interesting selection but I thought it might be interesting to profile the calculated properties, I used the DrugBank Database too ensure I got a more comprehensive dataset and then calculated properties as I have done for the Fragment collections. The results are shown below. Probably the most notable feature is the number that contain ionisable groups, over 60% of the molecules would be predicted to be ionised at physiological pH (note however it does include a couple of natural amino acids). Around 50% contain an aromatic ring (of which 2/3 are heterocycles). There are a couple of structures with more 3D shape (Memantine) but in general they would be classified as disc or rod-like. In general the results don’t look too dissimilar to the Published Fragment Hits. I’ve updated the page on published fragments, the dataset now includes over 800 published fragments hits abstracted from over 200 publications directed at nearly 130 different molecular targets using 22 different detection technologies and might be expected to give some insight into the type of compounds that appear as hits. With the caveat that the dataset only includes information that has been published. I’ve made a couple of updates to the Drug Discovery Resources pages. In particular I’ve updated the Published fragments Hits to include more examples, details of “promiscuous” compounds and summary of detection technologies and the targets explored. I’ve also updated the Aspartic Protease inhibitors page. As ever comments and/or suggestions very welcome. It is interesting to see how commercial fragment libraries are starting to evolve, from simple molecular weight cuts of available chemicals to more careful selection based on physicochemical properties. We now see several interesting design strategies being adopted. Those based on a screening technology such as the LifeChemicals Fluorine-based library to support 19F NMR-based fragment screening, and the Maybridge Bromo-Fragment Collection a collection of over 1500 bromine containing Maybridge fragments constructed as an aid to X-ray based fragment screening. OTAVA offers you new Chelator Fragment Library that comprises 575 compounds in total, Chelators demonstrate binding affinities suitable for FBLD screening and provide a diverse range of molecular platforms from which to develop lead compounds. Also, the propensity for chelators to bind metal ions allows for better prediction of their probable binding position within a protein active site in the absence of experimental structural data of the complex. Many attractive drug targets contain a free sulfhydryl group in the active site that confounds functional HTS assays due to its facile, non-specific oxidation leading to target inhibition. AnCore have developed a Targeted Covalent Inhibitor fragment library (TCI-Frag™) containing 100+ Rule-of-3 compliant fragments are conjugated with mildly reactive functionalities. The BIONET CNS Fragment Library is a focused library containing 700 Fragments selected for their suitability for Fragment Based Lead Discovery in the areas of CNS drug discovery and Universal target classes. I’ve continued to collect details of fragment based screening hits that have been reported in the literature. There are now over 600 hits reported for 113 different targets culled from over 160 publications. I’ll update the calculated properties for those compounds in due course. I was interested in seeing if the physicochemical profiles are different depending on the type of target, however as the plot below shows, the majority of those hits have been identified against enzyme targets so I think I’ll need more data before any meaningful conclusions can be made. In contrast when looking at the screening technology used a variety of technologies have afforded a substantial number of hits, when I’ve abstracted the latest batch of papers I’ll have a look at the profiles of the compounds identified using each technology. Finding the data is getting more of a challenge, it seems as fragment screening becomes more mainstream it is often not mentioned in the title or abstract. So if you have recently published a relevant paper if you could send me the reference or even a pdf I’d be very grateful. I’ve now updated the physicochemical property profiles of all the fragment collections I have access to, including the categorisation into rod-, disc- or sphere-like shapes I described last week. 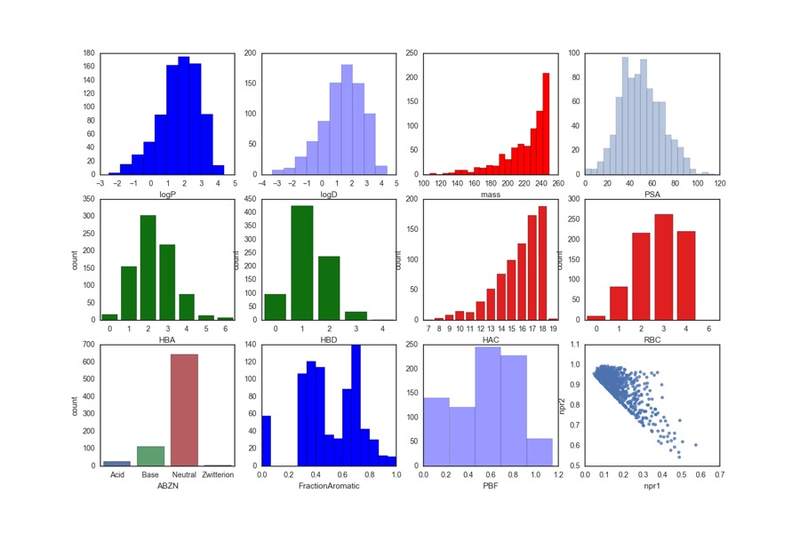 I thought it might be interesting to generate a plot of all 170,000 fragments to look at the distribution. I actually viewed the results in Vortex as shown below. This tool makes it easy to colour by “shape” and also allows me to highlight a few structures that appear at the extremism of the plot. 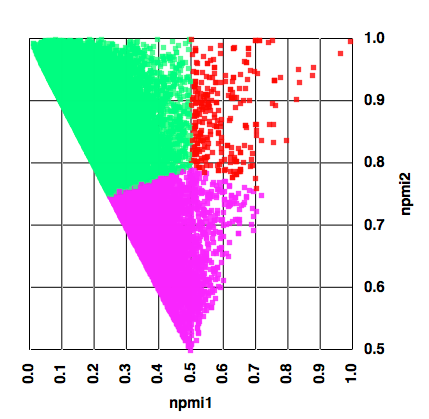 I recently updated the fragment collections page this included updating the physicochemical property profiles adding npmi (Normalized ratio of principle moments of inertia) as described by Sauer WH, Schwarz MK (2003) Molecular shape diversity of combinatorial libraries: A prerequisite for broad bioactivity. J Chem Inf Comput Sci 43:987–10030. DOI As the image below shows this gives a view of the shape of the molecules as to whether they are rod, disk or sphere like. 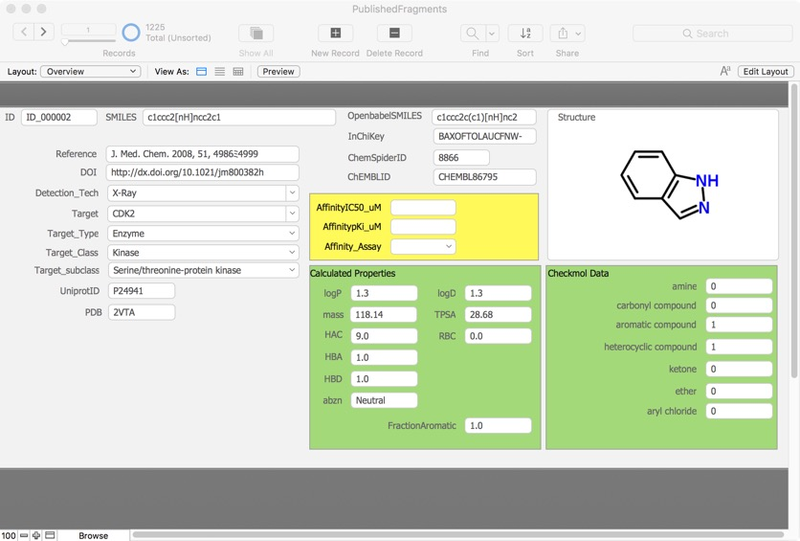 Whilst this works very well for individual compounds or small libraries the plot becomes a blur of overlapping points for larger collections and it is not really possible to compare collections. Whilst it may be possible to generate a single number as the “average” of each collection I’m not sure how useful it would be. So with help from Matt I decided to divide the plot into three sections as shown below. The centre point (c1, c2) was calculated using ( 0.5, (2sqrt(0.5) + 0.5)/(2sqrt(0.5) + 1) ) which is about (0.5, 0.793). If a point is below both lines then: (0.5 - 0.25) * (npmi2 - 0.75) - (0.793 - 0.75) * (npmi1 - 0.25) < 0 and (0.5 - 0.75) * (npmi2 - 0.75) - (0.793 - 0.75) * (npmi1 - 0.75) > 0 then it is disc-like. If not, then it is rod-like if npmi1 < 0.5 and sphere-like if npmi1 > 0.5. The result for a 35,000 compound collection are shown below, with the points colour-coded by the assigned category. 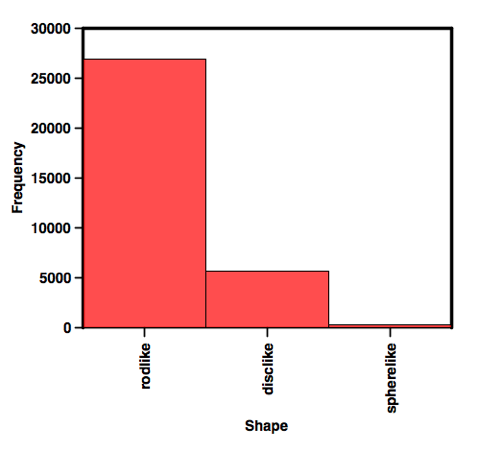 We can then create a categorical plot as shown below. I plan to update all the physicochemical profiles of all the fragment collections next week. I just added the dataset from the 3D Fragment Library Consortium. The 3D Fragment Consortium brings together UK-based not-for-profit drug discovery institutes and academic groups, working in partnership to build a collection of chemically diverse molecules with a particular focus on fragments that incorporate 3D structure. The consortium is looking to collaborate with other research groups to expand the collection and make it available for screening against new biological targets to help kick-start hit discovery programmes and provide a foundation for a vibrant pre-competitive drug discovery network across the UK. The 3D Fragment Consortium has identified a foundation library of 170 fragments to commence their screening activities. 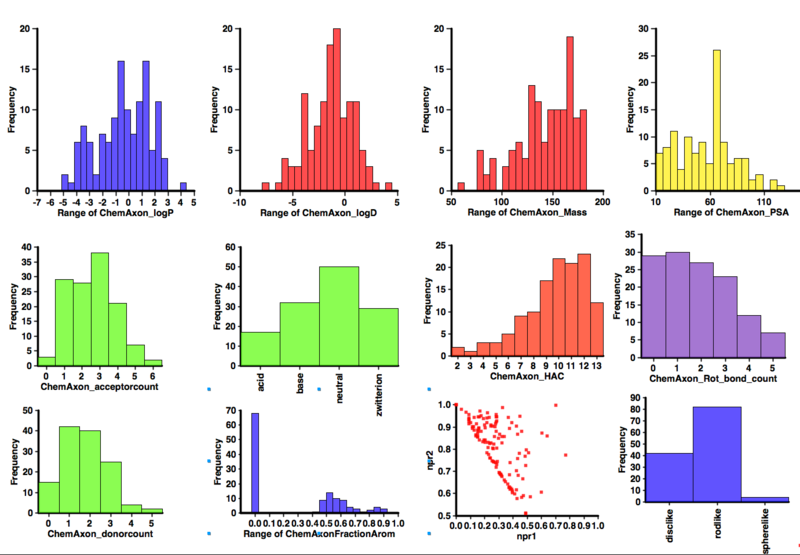 Comparison of all collections, and calculated physiochemical profiles. It is obviously early days yet but it will be interesting to see how this develops. A recent paper J. Med. Chem. 2013, 56, 2478−2486 DOI looked at the different ways that the initial fragments were subsequently optimised, looking at a variety of physicochemical properties and ligand efficiency indices. I’ve updated the known fragments page to include some of their conclusions. 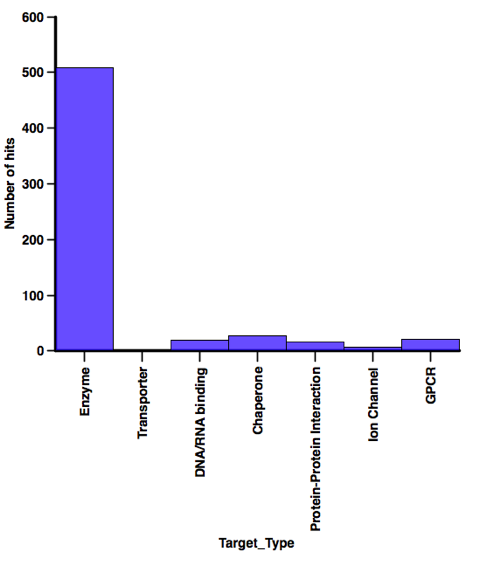 I’ve just updated the section describing fragment hits reported in the literature.The dataset now has >500 entries culled from 150 publications directed at nearly 100 different molecular targets using 18 different detection technologies and might be expected to give some insight into the type of compounds that appear as hits. I’ve calculated a number of physicochemical descriptors and identified fragments that have appeared as hits against multiple targets. I’ve just updated the section on fragment libraries, I’ve added a couple of new vendors and updated the existing vendors, there are now over 160,000 fragments available from commercial suppliers. I’ve recalculated the identity and similarity matrix. 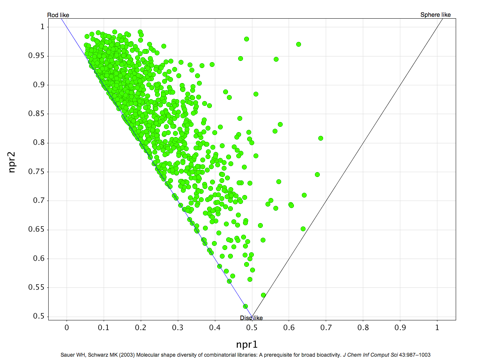 I’ve also updated the physicochemical property profiles and added npmi (Normalized ratio of principle moments of inertia) as described by Sauer WH, Schwarz MK (2003) Molecular shape diversity of combinatorial libraries: A prerequisite for broad bioactivity. J Chem Inf Comput Sci 43:987–10030. DOI As the image below shows this gives a view of the shape of the molecules as to whether they are rod, disk or sphere like, it is included with all the other calculated properties. I notice that a couple of the vendor with very large fragment collections now sell relatively small subsets, underlining the fact that a library of 2000 fragments is usually sufficient as a screening set. Access to the larger fragment space is only really needed when you come to explore the hits. In the past 15 years, fragment-based lead discovery (FBLD) has been adopted widely throughout academia and industry. The approach entails discovering very small molecular fragments and growing, merging, or linking them to produce drug leads. Because the affinities of the initial fragments are often low, detection methods are pushed to their limits, leading to a variety of artifacts, false positives, and false negatives that too often go unrecognized. This Digest discusses some of these problems and offers suggestions to avoid them. Although the primary focus is on FBLD, many of the lessons also apply to more established approaches such as high-throughput screening. 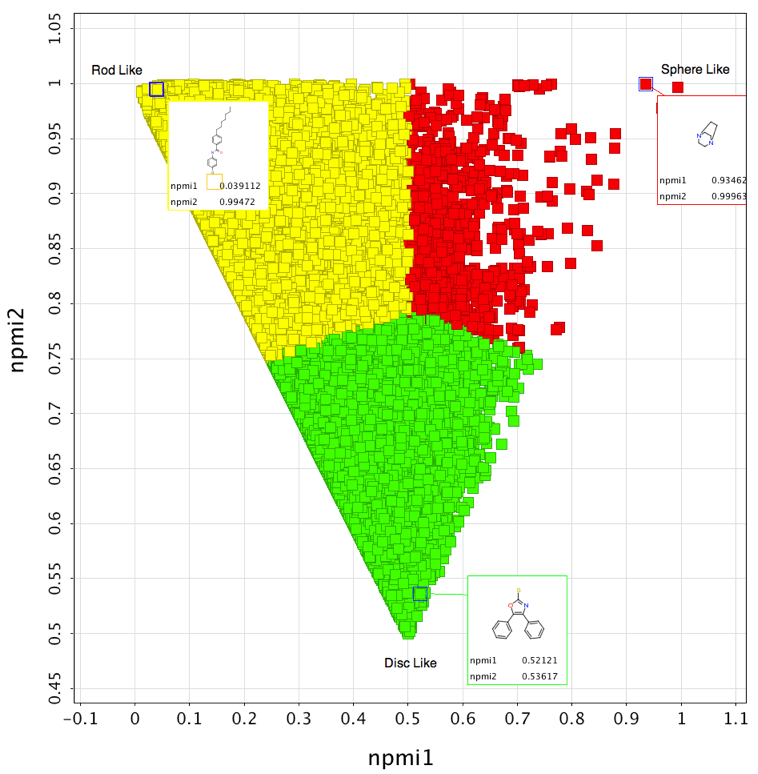 Whilst there are a variety of techniques to measure the properties or diversity of fragment libraries it is interesting to look at the profiles of compounds that actually appear as hits in fragment-based screening campaigns. I’ve been compiling a database of compounds that have been reported as hits in the literature, this database now has >500 entries culled from 150 publications directed at nearly 100 different molecular targets using 18 different detection technologies and might be expected to give some insight into the type of compounds that appear as hits. I’ve just updated the page containing the profiles of commercial fragment collections. With the growing need to streamline the drug discovery process, screening against fragment libraries rather than drug-like molecules has become increasingly adopted as an integral part of many drug discovery programmes. However, success depends on the quality of the fragment library, and many factors dictate quality. Practical Fragments has updated the its list of fragment-derived compounds in the clinic. There is now one approved, the B-Raf(V600E) inhibitor Vemurafenib, eleven apparently in Phase 2 or 3 and fourteen reportedly in Phase 1. I’ve updated the fragment-based screening pages, added new screening technologies, added a couple of new vendors and updated the fragment collection profiles based on the current fragment collections that vendors have provided. An interesting set of articles focussed on Fragment methods published in Drug Discovery Today. Fragment methods have now become well established within the repertoire of drug discovery technologies used within the pharma and biotech industries. 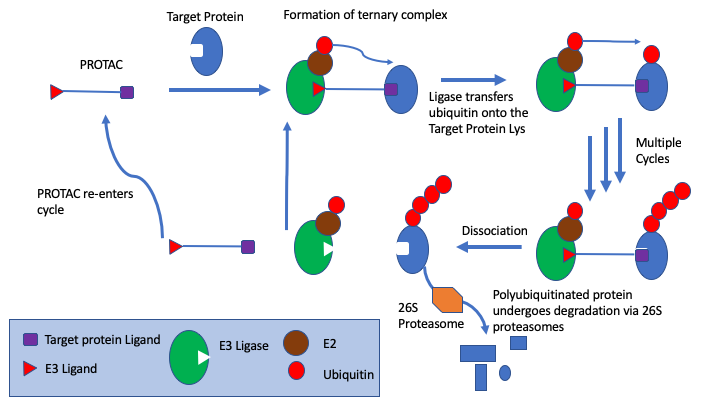 Success has been repeatedly demonstrated in the application of fragment methods as the basis for the discovery of drug candidates with attractive physicochemical properties for soluble protein targets….In this issue of Drug Discovery Today, Editor’s Choice highlights four recent papers that consider how to make the best use of fragments both in terms of their optimisation and their application more broadly in drug discovery. The papers featured are all available as free downloads, so please have a look at them; I’m sure that you will find them interesting and thought provoking. I’ve updated the page describing the different fragment collections. 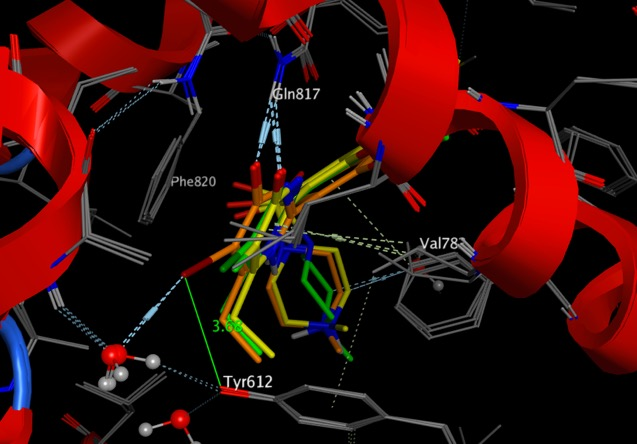 The fragment screening library I helped to design for Selcia has now been used to identify novel HSp90 ligands. I’ve just updated the fragment-based screening pages, I’ve updated a few of the fragment collections and added Vitas. Many thanks to all who provided details of their fragment collections. I’ve updated the sections on fragment based screening. I’ve just updated two pages. Fragment Collections on which I’ve added a couple of additional suppliers, and Fragment collection profiles on which I’ve added the profile of the TimTec collection and updated the collections from the existing vendors. It seems that as the collections evolve more of the collections are starting to look like they were designed rather than simply applying cutoffs (MWt etc) to an existing sample collection. We are starting to see less aromatic compounds and more consideration to the 3D structure. Several companies have kindly sent me updated copies of the structure files for their fragment collections. I’ve updated the analysis of the collections and added a couple more properties, by calculating the most acid/basic pKa I’ve catagorised the fragments into acid/base/neutral/zwitterion. I’ve also calculated the fraction of aromatic atoms (number of aromatic/number heavy atoms), one comment I’ve heard about some collections is that they contain too many aromatic compounds and have issues with solubility. Full details are on the Fragment Collection Profiles page. Just completed a project to help design a fragment library for Selcia to be used with their proprietary fragment screening technology CEFrag. Updated the list of commercially available fragment libraries. I’ve added a sections on fragment-based screening, solubility and updated the section on metabolism.